I'm using a simple 3 router topology: two Ethernet links, and a Frame Relay link between R2 and R3 using physical interfaces (multipoint); Inverse ARP has been disabled. The addresses all have the router number as the last chunk (chazwazza?). OSPFv3 has been spun up with everything in area 0 to give PIM something to work with. I've also added some loopbacks. This post is assuming that you know how to get this far... I'm not going to cover how to get OSPFv3 running properly here. Easy enough so far. But there's a few differences in what you're going to do next compared to IPv4 multicasting. In IPv6 PIM is automatically enabled on every interface that's already running IPv6, and it's running in what we all know as "Sparse Mode". At this point you should start seeing some tunnels appear. These tunnels are used by the routers to talk to their RPs. The PIM REGISTER and PIM STOP messages are sent over these tunnels. For now the tunnels will be up/down, but that will change once we get the RP information distributed to our routers. We're going to do that next. IPv6 PIM can use a couple different methods to distribute RP information. There's the same BSR we all know and love from IPv4. There's also static RPs. Lastly, a new method is embedded RP where the RP address is actually directly in the multicast address that a receiver wishes to join. Gone is Auto-RP and the sparse-dense nonsense that accompanied it (or Auto-RP listener alternatively). For this post I'm just going to use BSR. Static RP is self explained, and embedded RP would be a post in itself. In IPv6 BSR works pretty much the same way. You first define one or more BSR candidates, and you then define one or more RP candidates. I'm going to use the loopback of R1 as my BSR. 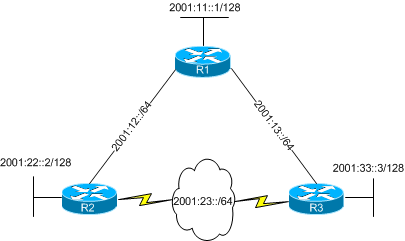 R1(config)#ipv6 pim bsr candidate bsr 2001:11::1 ? Next we need to define our RP. I'll use the loopback of R2 as my RP. R2(config)#ipv6 pim bsr candidate rp 2001:22::2 ? Here we also find the usual suspests of config options (default priority is 192, highest wins). It's at this point you should start seeing those tunnels that were created earlier transition to the up/up state (that is if everything is working properly). If they don't then you most likely have an RPF failure somewhere and it's off to debug land to troubleshoot the problem. But as near as I can tell that's only good on the C-RP itself! It won't show you other C-RPs, and if we try on a different router, like our BSR, it shows nothing at all! But this one only works on the BSR! If you try that on anther router, even the RP itself, you get squat. I clearly must be missing something here. There just doens't seem to be the equivilent to 'sh ip pim rp map' anywhere. So how do we verify that we have a working RP short of joing a group somewhere and firing off the traffic? Well, we can look at our tunnels of course! Ah HAH! The first tunnel is obviously Embedded RP related, but the second tunnel is between R1 where we ran the show command and the the RP that we configured on R2! We can take this a bit further and look at the tunnel itself to try and glean a little more information. We can see our tunnel is up/up, we have valid source and destinations, and the tunnel protocol and transport are PIM and IPv6 respectively. OK, everything is looking good. If our RP wasn't configured correctly, for whatever reason, the tunnel would not be present on our routers at all. Neither of the above commands would give us any information at all. And then fire off some pings (because that's how network admins roll). I actually had a IPv6 multicast post in my drafts. As you saw on twitter I was interested in the register process and I know how it works but I haven't seen a single document describe it in detail though. show ipv6 pim range-list should be the equivalent of sh ip pim rp mapp. Show ipv6 pim tunnel is a good command to have as well. Debugging v6 multicast is a PITA. When I tried it on Dynamips I pretty much lost the router due to all output. I guess this could be due to that v6 uses multicast for ND etc so you will see that traffic as well if you debug. How long to your next attempt at the lab? Actually part of what got me going was your Twitter post. I've been wanting to break this down for a while and the other night I had the time so I started writing this. 'sh ipv6 pim range-list' looks pretty good. I hadn't really looked at that one before. Thanks for that! Yeh when I'm looking at this type of multicast stuff I find that debugging ipv6 pim is much better to see what's going on. You should be able to see the tunnel type stuff you're looking for in that debug too. Next attempt is Jan 13. Coming fast! Great. I hope you pass on your next attempt. I have my first attempt coming up in 2 months. Got any good advice? :) Are you mostly focusing on Vol1 or Vol2 scenarios right now? The only real advice I have is in my previous post about my first attempt. I'm looking at IPX vol1 and vol4 labs for the most part. I suggest to try the exact same scenario but with no loopbacks, using the serials or fastethernet as the RP / BSR, that is going to be funny!